Though the mayor has no actual power over the contract negotiations, observers like Austin say he should be using his bully pulpit to support his constituents, namely students and parents. Nationwide calls also have arisen for Gavin Newsom, the state’s new governor of one week, to backstop Garcetti. Newsom has reportedly been in ongoing talks with both sides and faces the specter of more strikes from other financially strapped districts around the state. On Friday, a few hundred teachers in Oakland held an unauthorized walkout to jolt stalled negotiations there. Pressure is mounting for a solution as the L.A. strike exacts sizable financial tolls on the district — a net $75 million as of Friday afternoon from student absences — and on teachers, as well as ongoing educational losses for district students, who have now cumulatively missed a million and a half instructional hours. Attendance plummeted sharply Thursday, with only about 84,000 of the district’s 486,000 enrolled students coming to school. The mayor’s office disputed these observations, pointing out that he has played an outsized role in student education by jumpstarting Los Angeles College Promise, expanding L.A.’s BEST afterschool program and launching the city’s 16 FamilySource “College Corners,” where peer mentors provide college planning and application assistance to students and their parents. 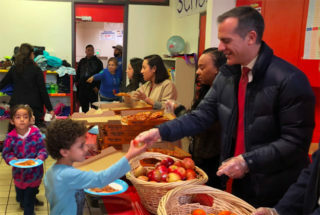 A Garcetti spokeswoman said by email Friday that the mayor has consistently supported students and “will continue to have his office facilitate negotiations” to get kids back in classrooms. L.A. Unified will likely have to take “at least a hop of faith” and commit more funds to secure a deal, Garcetti said at a Monday news conference. Beutner responded indirectly Tuesday, saying, “This isn’t about faith and hope, this is about the reality, unfortunately, of the limits that we have.” The district is facing billions in long-term debt, rising health care and pension costs and declining enrollment. Garcetti also stated that the two sides “are not talking very far away from each other” — an optimistic take on nearly two years of heated disputes largely centered on money, class sizes and charter school restrictions. Caputo-Pearl himself said Thursday morning it would be unrealistic to expect any results on the first day of negotiations given years of contention. Austin said rather than praising teachers, Garcetti should provide public assurance that he’s focused on students, a group both the union and L.A. Unified say they’re fighting for. He added that the mayor could resurface topics — such as teacher quality and increased accountability on all schools, not just charters — that are not in the contract negotiations and are now buried by what has become a politicized fight over salary, class size and charter caps. While UTLA did back Garcetti for mayor in 2013, Regalado, the Cal State LA professor, doesn’t think Garcetti feels pressure to appease UTLA in a quid pro quo arrangement. Rather, Regalado sees Garcetti’s stepped-up involvement largely boiled down to politics. There have been widespread whisperings that the mayor is eyeing a White House run in 2020, making it “unwise,” Regalado said, to stay mum on a nationally watched teacher strike. Various other Democratic powerhouses — U.S. Sens. Elizabeth Warren and Kamala Harris, to name a few — have espoused their support for L.A.’s educators on Twitter. The possibility of copy cat strikes looms, starting with Oakland Unified School District. *Updated Friday afternoon with Beutner reporting instructional hours lost and the cost to the district for lower attendance.